As the Red Sox, Celtics, Bruins, Revolution, and Patriots well know, Bostonians are experts at the art of sarcasm. But they apply it to the other local "sport," too, the sport of politics. The MBTA is outmoded, unsafe and incapable of withstanding the rigors of New England winters. When one link in its corroded chain breaks the whole system is thrown into disarray, when multiple links break at once the entire city and region collapses into massive gridlock. Trains are kept decades beyond their service life because for decades nobody in state government wanted to take responsibility to fund maintenence and modernization of public transit. So here's where you come in. If the internet can help one working class guy in Detroit who struggles every day to get to work surely we can help the hundreds of thousands of working class people in Boston who rely on the decrepit MBTA to get them to work, school, doctors appointments or the grocery store. All we're asking for is 30 billion dollars (GoFundMe limited this to 300 million dollars though). As of this writing, only $10 has been contributed, but I sense a bandwagon pretty soon. 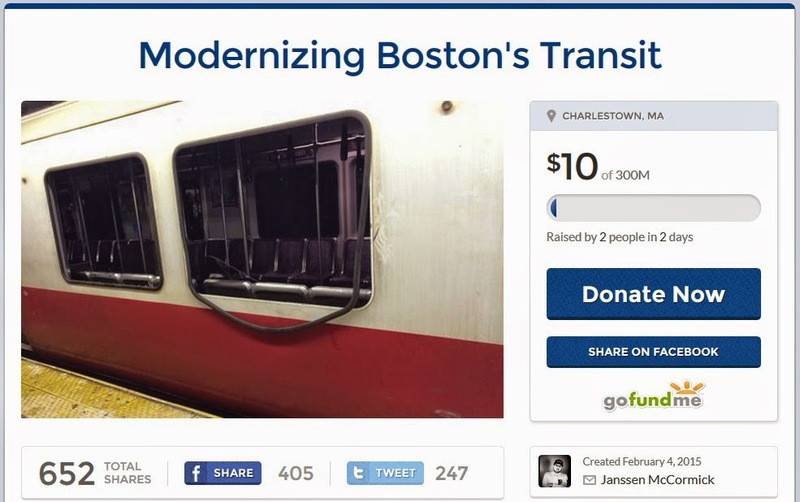 Commonwealth Magazine has called the history of the T a textbook case in civic dysfunction. I addressed the issue on this blog also, here and here. The city is hoping to become the site for the 2024 Summer Olympics. Let's just hope the international Olympic governing body is not watching the local news.